"The speaker series is a fantastic opportunity to cast a version of the world that we all want to live in. The work of the Emerging Leaders and BHCHP is important work." The Speaker Series is an initiative of the Boston Health Care for the Homeless Program Emerging Leaders Board. 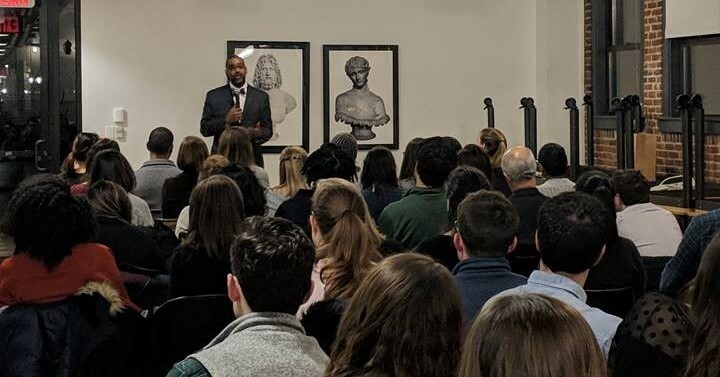 The Speaker Series brings together civic-minded young professionals in the Greater Boston Area through open-dialogue and conversation with leaders in the healthcare, government and business sectors. Although the topics will vary, speakers will highlight how these areas intersect with philanthropy to shape the City of Boston. BHCHP’s Emerging Leaders Board is a group of twenty socially conscious young professionals from various organizations and companies across Boston, who give their time and talents to support BHCHP’s life-saving mission, caring for homeless individuals and families. Contributing directly to the cause through volunteerism and service. Learn more about the Emering Leaders Board and how to apply.